I'll admit to a slow-start for this book for me. I struggled to connect with the characters, even though there was a good bit of conflict between them at the beginning. It truly opened as all good books should, but I still had a bit of disconnect and found the first few chapters slow. But then Ransom snagged me with one of his glances at Shelby. Their interactions and banter began to fly off the page, and while the voice of this author was slightly different than what I typically read, her characters began to beg me to turn the pages. The slow beginning was forgotten, and I fell for the budding relationship between Ransom and Shelby. At the same time, a sub-plot deepened conflict within the story providing a great external issue that nearly tore apart our hero and heroine. It was well written and woven throughout, well timed, and believable. I closed the last page with a true smile on my face and the feeling like I'd really spent time with these characters. I loved the depth of their relationship. Mary Jane created unique individuals and gave them small interactions (rings, greenhouses, diaries, paintings...read it, you'll see) with huge meaning. It was those special touches I believe I loved the most. 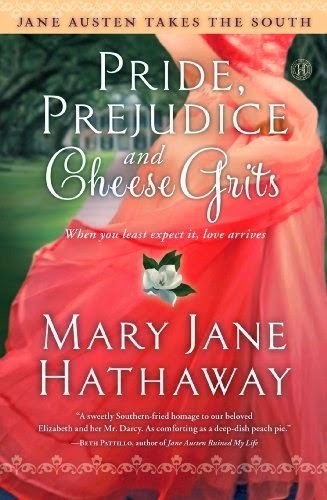 I happily give Pride, Prejudice, and Cheese Grits 4 out of 5 stars and will be soon picking up the sequel:) You can purchase it here. Happy reading this weekend! You're the second person I've heard say great things about this one. I'll have to add it to the TBR pile...which is massive at the moment. LOL! Ha! I don't think I can even see over mine anymore:) But this is definitely a fun one to add. I'll add it to my TBR pile too. It's not a mountainous size or anything. Looks like a goodie! Thanks for sharing this, Susan! I enjoyed this story too. My favorite scene was when she interrupts his classroom after her comes down on the boy for eating. Hi Susan! Thanks for reviewing my book. And if you thought the first few chaps were slow, you should have seen the first draft. It was Shelby in her car, thinking, for about a whole chapter. HAHAHAHA! Newbie writer sins! P.S. This is showing my other pen name. I'll admit to doing a double take when I saw that name next to your picture. So glad you stopped by and I cannot wait to read your next. And though I may have felt it was slow, the entire book made up for it. Truly enjoyed it! !